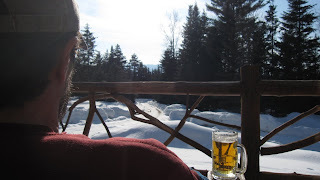 Porch Time Returns To The Adirondacks! An essential part of Adirondack living is outdoor living. That means it is frequently so nice outside you don't want to go in the house, so you don't. We are experts in spending time outside and squeeze in a little porch time whenever we can. It was a special apres-ski treat today when we dug the Adirondack chairs out of the shed for the first official porch time of 2010. It is a gorgeous sunny, sparkling blue, winter day in the Adirondacks. Maybe that is why I was already smiling when I clicked on the link that sent me to this video. Now I am laughing out loud although I am not even skiing yet! Enjoy.